Printer cartridges are usually expensive. Cheaper is third-party ink. These low-priced cartridges deliver decent quality, but only one printer update is gone from useless. First the printer complains and demands new ink. Who ignores that, at some point has ugly stripes in the printed image. Then it is high time to buy new cartridges or refill the old ones. Because the sensitive printheads can be destroyed during printing tests without ink. On the other hand, there is the option to buy printers with a solid ink tank. Although these are more expensive to buy, they are quickly recouped, especially for folio printers, because of the low follow-up costs. In general, this variant is considered the cheapest, especially when it comes to color printing. “Original ink is available in bottles for easy refilling, and a filling for 5,000 to 6,000 pages costs an average of 45 euros,” says Opitz. Those who look for ink to refill their tanks on the open market, come in two ways: universal ink, also called dye ink, and pigment ink. “In general, you should not buy a universal ink,” says Florian Rigotti from the specialist portal “Druckerchannel.de”. Although pigment ink is more expensive, it ensures better quality when printing on plain paper. And because the printer manufacturers use different systems and slight variations of the primary colors cyan, magenta and yellow, one must pay attention to an express note for which manufacturer the ink is intended when purchasing the ink. If you buy new cartridges, you have to choose between the manufacturer’s original replacement and cartridges from other suppliers. 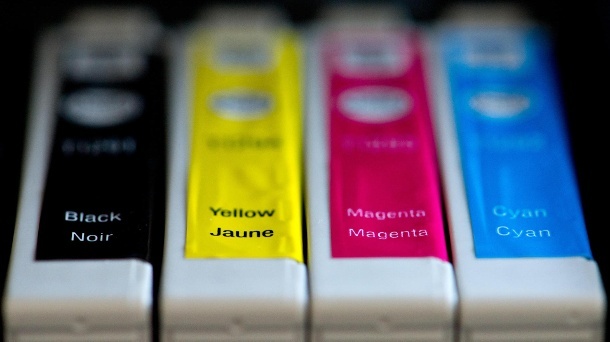 The Stiftung Warentest notes in its recent comparison of ink cartridges: “Cheap cartridges often pay off – with few exceptions, the devices can easily work with foreign cartridges.” With the purchase of cartridges from other providers, consumers would usually save a lot of money – and the quality is usually passable. In the past, it has happened again and again that manufacturers have blocked foreign cartridges. This is not the case anymore. But because there may be firmware updates at any time, lock the cartridges, advises Florian Rigotti to take precautions: “One should consider when using foreign cartridges so that you disable automatic firmware updates on the printer or the printer through his router and the Internet access blocks.” However, you should keep an eye on the published updates to be able to identify very important updates and, if necessary, still be able to play them. Before buying a printer, you should always keep in mind the amount of printing you are printing. There are also printers with a cartridge-printhead unit. Devices with these so-called combination cartridges, which are available only from the manufacturer, are particularly suitable for less printers. Because with hopeless clogged nozzles or a defective printhead, the problem with a new cartridge is solved the same. At higher print volumes starting at about one hundred pages per month, users should always pay attention to printers with large cartridges and thus high print range or resort to an ink tank model. Worn out ink cartridges do not belong in the trash. Empty original cartridges can be returned to the manufacturer – consumers can use their websites to request partially prepaid return envelopes, Stiftung Warentest explains. This service also offer some suppliers of foreign cartridges. There are also buyers for empty cartridges, but accept only original cartridges. Another alternative is the recycling yard. But even online retailers or electronics stores offer a recycling service.